A very scenic route along the Campaspe River, Botanical Gardens, passing historic features, a coffee stop, and finally the post office. It takes you along the Campaspe river, and along a residential street which features a variety of architectural styles, bluestone gutters, mosaics and a wonderful bluestone church. Pick up the river walk path anywhere in the Kyneton Botanical Gardens and turn right. Follow the path until you reach Hutton Street. (There is no street sign so look out for a little bridge.) Turn right before crossing the little bridge and walk along Hutton Street until you reach Mollison Street. Take a ?pit stop? 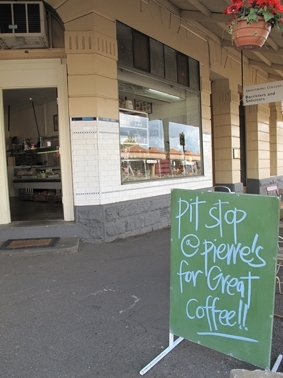 at Monsieur Pierre?s (not open Sundays) before turning right at Mollison Street. 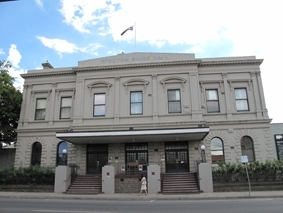 The landmark 1870 Post Office building is just past the very gracious Kyneton Town Hall. The Gardens date back to 1858. Wide lawns slope down to the Campaspe River. 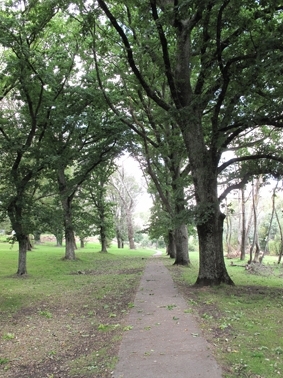 There are 17 trees listed as significant by the National Trust. The remains of the swimming pool formed between 2 weirs. 1935 has been cut into the base of what was the diving tower. 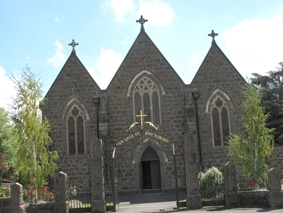 A beautiful church, with fantastic wrought iron gates (one of the many historic buildings in the area). There are lots of activities happening at the Town Hall - festivals, workshops, performances. 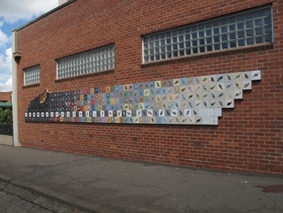 A beautiful mosaic to commemorate the fire in Redesdale and surrounding areas in 2009. 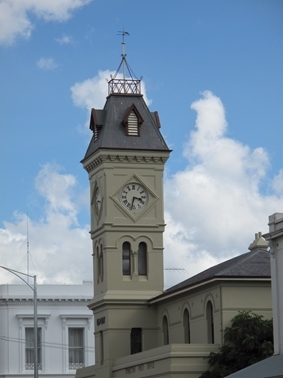 (see side of Town Hall building). This post office was built in the 1870s and continues to function as one today. The clock tower helps the locals keep to the same time!